The Christmas season is a sweet time for spending time with friends and extended family members, for giving generously, and for making memories with our children. It’s supposed to be a calm, precious time of year. But gift lists, homemade goodies, stocking stuffers, decorations, and social gatherings can all quickly add up. Then, before we know it, we’re worn out, exhausted, running in circles, and have spent so much money on Christmas that we have no idea how we’re going to pay the bills. I’d like to suggest something else this year. Something better. Often, our family members will have the most fun when we’re relaxed and really with them, than when we’re rushing around to check one more “special” activity off our list. Today I want to share some questions I’ve found helpful to consider when simplifying my family’s holiday season, and I hope you’ll leave a comment at the end of the post to share what you’re doing to keep things simple in your own home! 1) Who should I purchase a gift for? It can be so fun to give to others! But, go ahead and see where you can pare down your list. A good test is to ask yourself is, “If I knew this person wasn’t going to give me a present, would I still want to buy for them?” If your answer is no, then cross that person off your list! If you’re crossing someone off your list who you usually exchange gifts with, make sure to very gently let them know now that, due to time and budget constraints, you won’t be able to purchase a gift for them this year. Yes, some people may be upset, but anyone who truly loves you will understand, and some people may even be relieved to know they now have one less person to buy for! 2) How can I simplify the gifts I’m giving? For example, you could make a simple body scrub for the ladies and a meat rub for the men. Or you could make packets of snowman soup, cookies, or easy fudge as small gifts for everyone on your list who isn’t an immediate family member. But these are just suggestions! Use your own skills and interests to come up with a creative and thoughtful present you think several loved ones will like. Remember that most people just enjoy being thought of and remembered, so simple, frugal gifts are often a sweet gesture that will remind others you’re thankful for them this holiday season! 3) Am I protecting my time? Many of us genuinely enjoy attending holiday events! But if we’re not careful, events can push out the things that are most important to our families. So let’s commit to carefully checking our calendars before saying yes. If the event doesn’t fit in with our schedule, it’s okay to politely decline a few invitations. 4) Is this important to my family? I’m always amazed at the simplicity of requests when I ask my husband and kids to list their one or two most important activities they want to do each December. Finding out what’s truly important to our families can help us see where we can simplify, as well as which traditions we can skip altogether, without anyone feeling like they’ve missed out. 5) Is my motive pure? We can feel a lot of pressure to have a house that’s perfectly clean and decorated, or to serve a meal that’s absolutely incredible. But putting that much pressure on ourselves is unnecessary. We can choose to keep things simple and frugal as we seek to bless – not impress – others. It’s counter-cultural to have a simplified and relaxed holiday, but go ahead and give it a try this year. Mark things off your to-do list, pare down your gift list, and find out what’s really important to your family, then graciously say no to the rest. 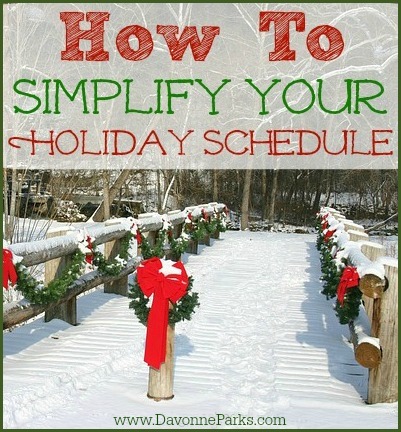 I’d love to hear: What suggestions do you have for simplifying the holiday to-do’s?